Feeling a wee bit stressed about your upcoming military move? No sweat! 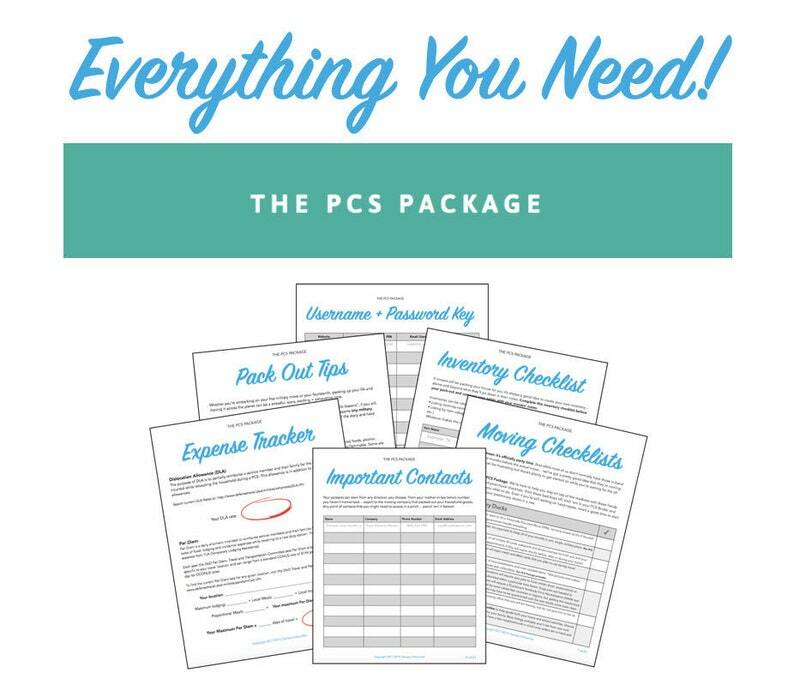 We're here to help you stay on top of the madness with The PCS Package: A hefty bundle of online documents and printables to help you organize and minimize the stress of your PCS! Simply purchase, download, and print these bad boys out + and stick ’em in your PCS Binder (which we’re gonna help you build) and we’ll remind you what to do! Whether you’ve got orders in-hand, a Letter of Intent or even just verbal confirmation – now’s a great time to start getting all of your Preliminary Ducks in a row. THIS IS A DIGITAL PRODUCT. Nothing will ship. Helping you calculate dislocation allowances, per diems, mileage reimbursement, etc. A collaborative effort of over 20 military families who've been through the PCS ringer, lived to tell the story, and have offered up their best advice to you! From your mother-in-law to the company that packed out your HHG – technology can be a beast. Make sure you have all of your important contacts written down in one spot. Nope, not at all. The PCS Package can be utilized by anyone serving in the United States Armed Forces, regardless of branch of service. The PCS Package was born out of a need to simplify and organize the PCS process. A military spouse with over 17 years in the game (+ 4 kids, 3 cats and a partridge in a pear tree), we found ourselves dusting off the same ‘ol binder, tabs and organizational tools each time a set of new orders came through for our family. The PCS Package is our game face. These documents are how we've kept our family organized and on-track with each PCS, tweaking and fine-tuning them endlessly over the years. The PCS Package is here to help you stay organized! It is something that your military family can use again and again throughout your years of service.